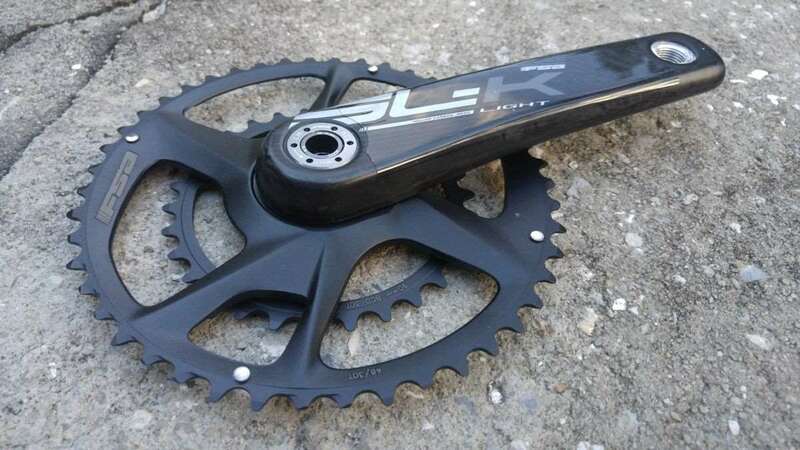 FSA SL-K 46/30 crankset (under review). 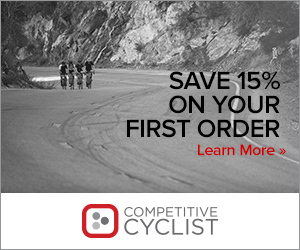 Gearing selection is part of the puzzle that goes into preparing one’s bike for a ride, event or race. To some, this subject can be a bit mysterious, almost in the same vein as the right tyre pressure. To have it spot on yields a ride that is sublime and enjoyable. Get it wrong, and those difficult to turn gears can make for a painful experience. 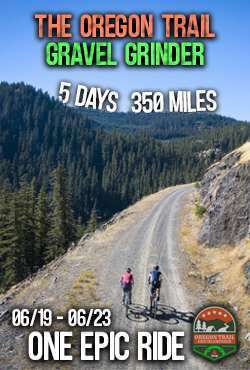 A certain level of discomfort and sometimes pain is part of the gravel cycling experience, but I like to keep that to a minimum. 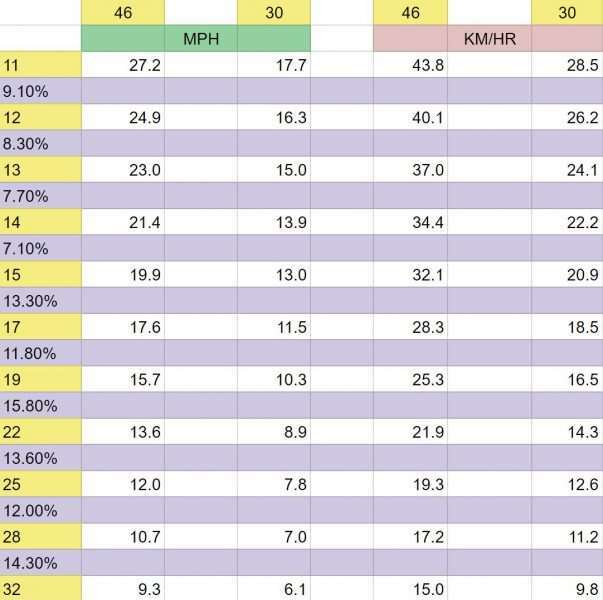 Case in point is some of the gears and chainring ratios I see fit to many bikes sold by prominent manufacturers. In this instance, I refer to the 50 / 34 chainring combination. On a road bike, the venerable “compact” chainring setup as it is known, provides a well-balanced chainring pairing, particularly when it is matched to an appropriate cassette for the terrain you’re riding. Panaracer Gravelking SK 700c x 38mm. Things change a bit when you ride on gravel roads. Tyres get bigger, their width and height increases. 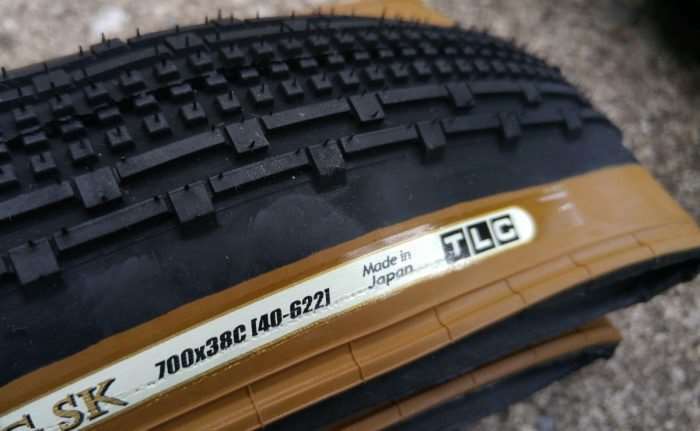 This changes the outer diameter of the tyre which directly affects your gearing. Suddenly, that 50 / 34 chainring combination on the same 700c wheels becomes a little more difficult to turn over. 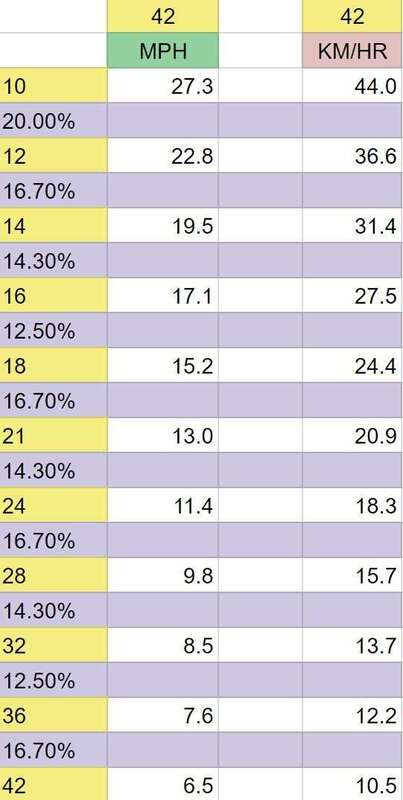 To best illustrate this, I have prepared some gearing charts, calculated with the help of an online gearing calculator, courtesy of the late and great, Sheldon Brown. The gearing charts illustrate how much changes when you switch from a 700c x 25mm tyre to a 700c x 38mm tyre. Starting at the top, the first number, 28.5, is the speed in miles per hour possible riding a 50 x 11 gear at 80rpm with a 700c tyre, 172.5mm crankset and an 11-28 cassette. Each gear on the cassette is listed below in order. 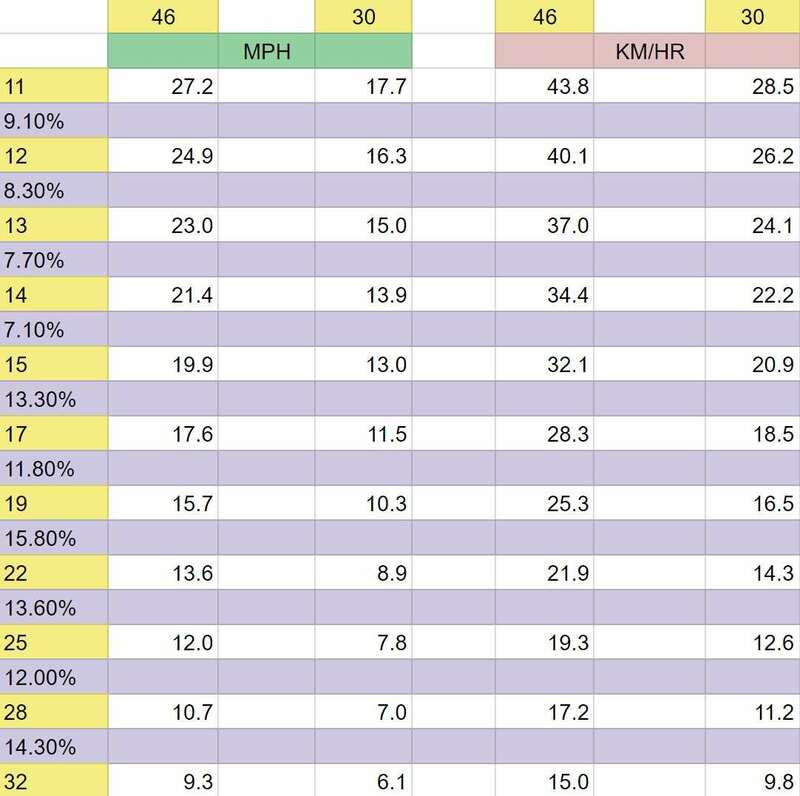 The next column lists the speeds possible with the 34 tooth chainring, etc. The columns at right are the speeds in kilometres per hour. 50 / 34 Chainrings, 700c x 25mm tyre, 172.5mm crank, 11-28 cassette, 80 rpm. 50 / 34 Chainrings, 700c x 38mm tyre, 172.5mm crank, 11-28 cassette, 80 rpm. The two charts speak volumes. 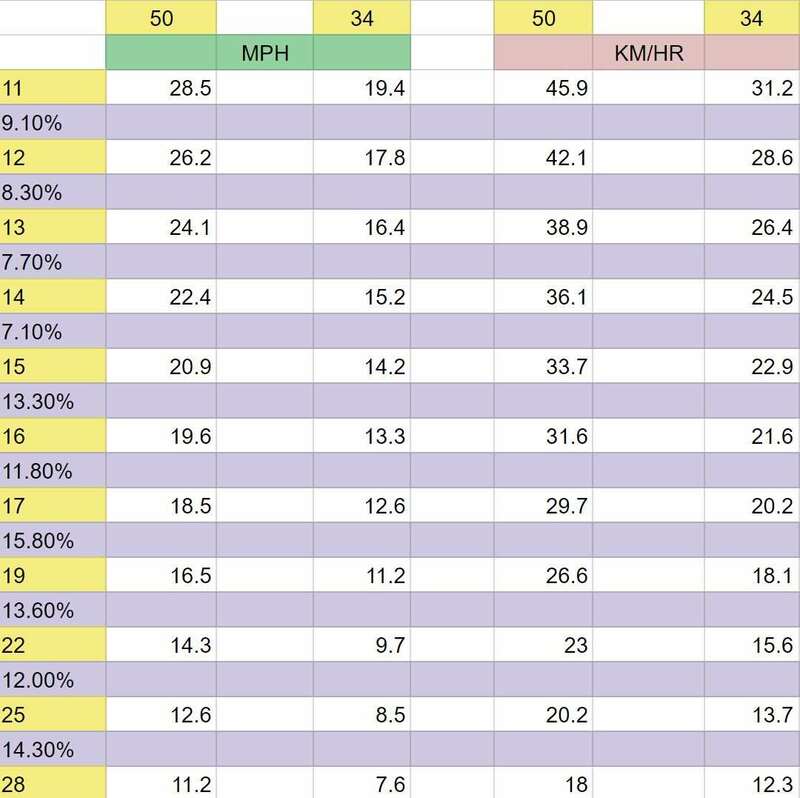 The 50 x 11 gear combination with a 700c x 25mm road tyre ridden at 80rpm will reach 28.5mph / 45.9km/hr. Switch to a 700c x 38mm tyre at the same gear and rpm, and speeds change. 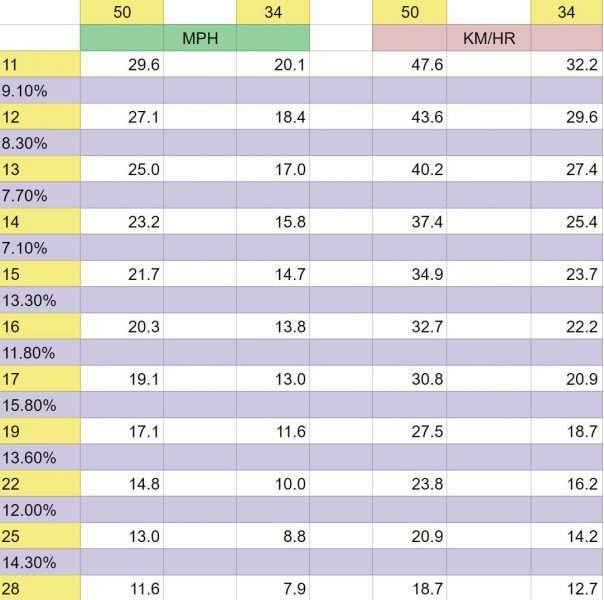 29.6mph / 47.6km/hr. Tyres and gears make a difference, in more ways than one! What follows are tables of some popular chainring and cassette combinations in gravel, including some 1x setups. We left 650b wheels out of these tables and a stack of other possible gearing combinations, else this article would go on forever. 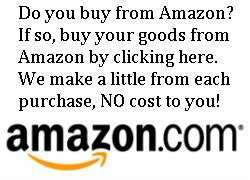 If you’re interested in calculating your own setup, please visit Sheldon Brown’s gear calculator link. 46 / 34 Chainrings, 700c x 38mm tyre, 172.5mm crank, 11-32 cassette, 80 rpm. 46 / 30 Chainrings, 700c x 38mm tyre, 172.5mm crank, 11-32 cassette, 80 rpm. 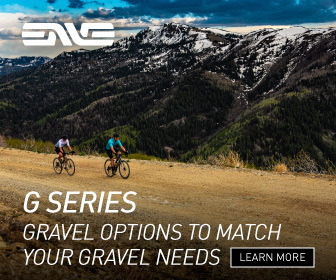 1x drivetrains have been making inroads to gravel as our recent video proved. 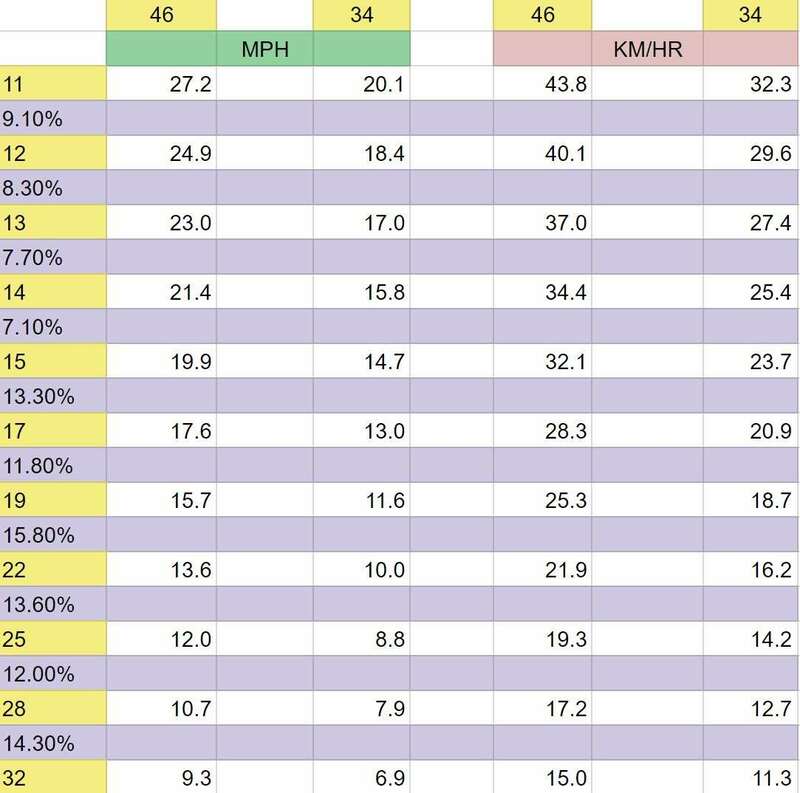 Some riders love the simplicity of only one derailleur, but the following charts illustrate the gaps that begin appearing between the bigger cogs on the cassette. The gearing gaps widen when you increase the chairing and rear cassette size, although they are consistent, particularly on the 10-42 11-speed cassette. On the positive, companies such as SRAM, leaders in the development of 1x drivetrains, have done their homework. 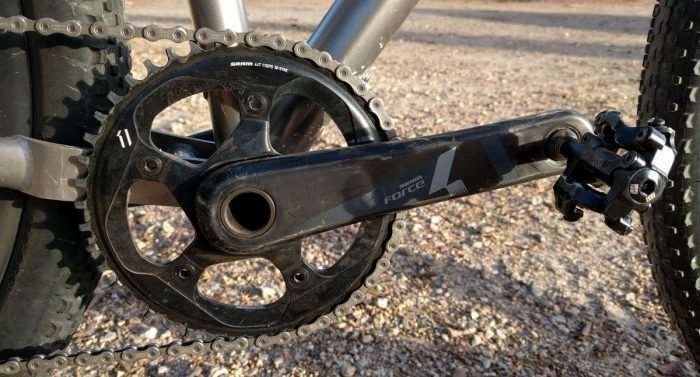 The company’s single chainring drivetrains offer excellent performance and are standard equipment on a growing number of gravel bikes. 40T Chainring, 700c x 38mm tyre, 172.5mm crank, 11-36 cassette, 80 rpm. 42T Chainring, 700c x 38mm tyre, 172.5mm crank, 10-42 cassette, 80 rpm. 1x isn’t for everyone. 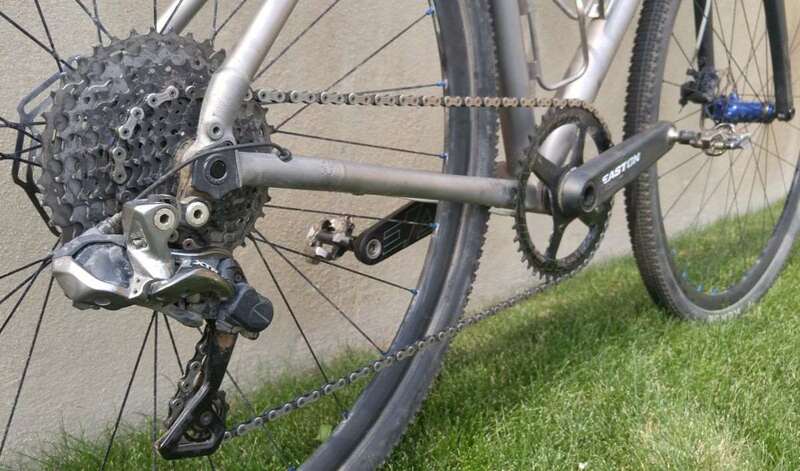 If you prefer smaller increments between each cog / gear, then a 2x / double chainring configuration may suit you better. Above, the Moots gravel bike of Jeremiah Gantzer.